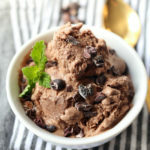 Rich chocolate vegan ice cream blender ready in minutes and frozen to creamy bliss without congestion causing lactose. 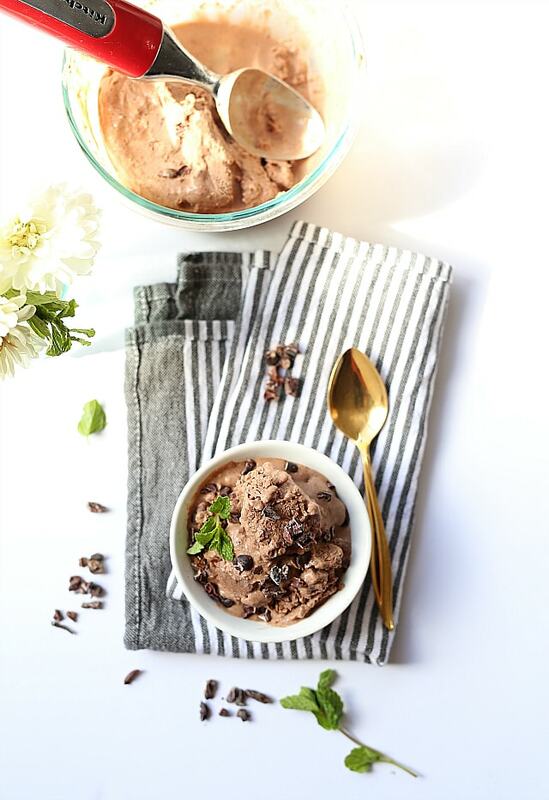 Blend 4 ingredients, add cacao nibs, freeze and serve by itself or in an ice cream cone! March winds blow through the air as April showers bring about May flowers. A true sign that spring and summer are near! It has been pretty windy and rainy here in Santa Barbara this past month. You may have seen the news with all the flooding and trees that are blocking the streets. But Santa Barbara sure is surprising with one day raining and the next day the air smells of spring! So far our house has been safe on these rainy days and we stay tucked away inside making soup. But on the off days where the sunshine is brightly gleaming through the windows we have been making ice cream in preparation for upcoming warmer days. And just because we love ice cream! For children, summer is a time to be surrounded by play twenty-four hours a day seven days a week. You just had your last day of school with tears in your eyes as you hug your friends good-bye till next year when you get to see them every day again. When school ends summer has officially arrived with daily afternoon snacks consisting of Popsicles and ice cream to save the day in hot, muggy, humid weather. The sight of someone passing by with an ice cream cone dripping down the sides as you watch them struggle lick after lick is saddening because all you want is one cone for yourself. Fast forward to adult-hood and your doctor is telling you all the congestion problems are from dairy. No more ice cream, no more milk shakes no more warm weather fun. Well at least before dairy free ice cream became a thing! 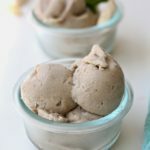 Vegan ice cream is the perfect alternative if you are lactose sensitive or are trying to eat healthier overall. Most dairy ice cream contains filler ingredients to thicken it up and preservatives to make it last not to mention hormones that can absorb into your body from cows. Plus most ice creams have cholesterol from the saturated fats in cows milk. When making vegan ice cream make sure to use full fat canned coconut milk for best results. Coconut is a natural plant based food. Anything plant based is the most natural way to absorb nutrients! Lets break down the ice cream ingredients, because you know I like to know all about what is going into our bodies and how it can help us. Coconuts contain easy-to-digest fatty acids, are plant based and can help boost the metabolism. 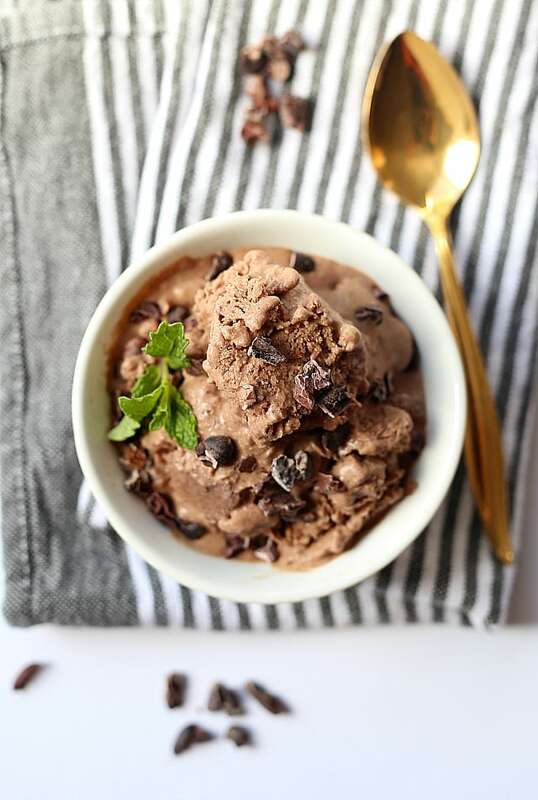 The downfall is they are high in saturated fats and calories so make sure to only eat a small of this chocolate vegan ice cream at a time. I know that is gonna be hard because it is just so good but I know you can do it! Coconut is a delicious seed from a palm tree and grows in most tropical areas. The oil is used in no dairy creamers, baked goods and for sauteing vegetables. The creamy coconut meat that lines the interior of the nut is raw and used to flavor ice cream, smoothies, shakes and baked goods. Coconut milk is the sweet white fluid in the heart of the meat. It is used for marinades and drinking as milk. Chocolate cocao nibs come from the cocoa beans and are carefully roasted to bring about deep rich shades of brown. Cocao nibs are packed with antioxidants, protein and fiber. Maple Syrup is simply boiled down maple sap. There are only about 50 calories per 1 Tablespoon. Maple syrups nutritional value is the syrup has traces of potassium, calcium and other minerals. 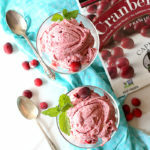 My favorite party about this vegan ice cream is that it is blender ready! That means no hassle over a bunch of dishes just toss the ingredients in the blender and mix. Make sure to save the cocao nibs for after blending and drop the into the bowl to set in the freezer. 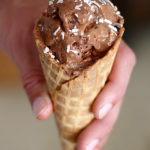 Rich chocolate vegan ice cream blender ready in minutes and frozen to creamy bliss without congestion causing lactose. 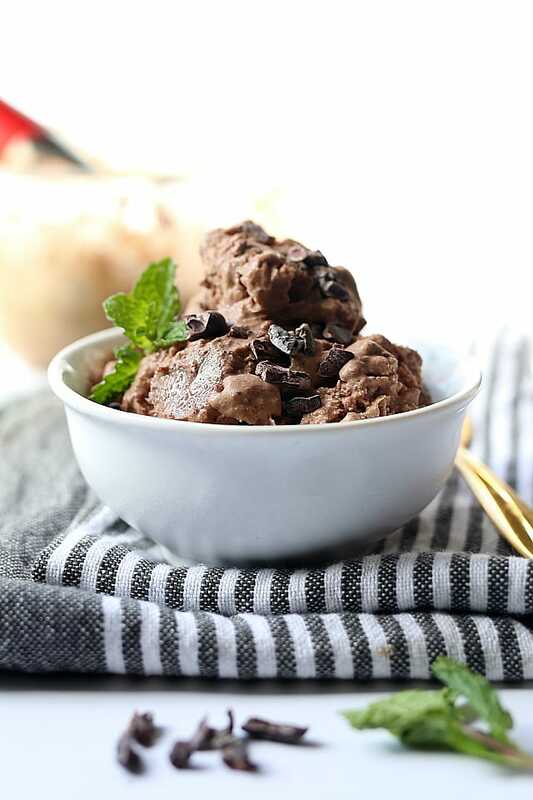 Blend 4 ingredients, freeze and serve by itself or in an ice cream cone! In a blender add the coconut milk, cocoa powder, maple syrup and vanilla. Blend until smooth then pour into a freezer safe dish. 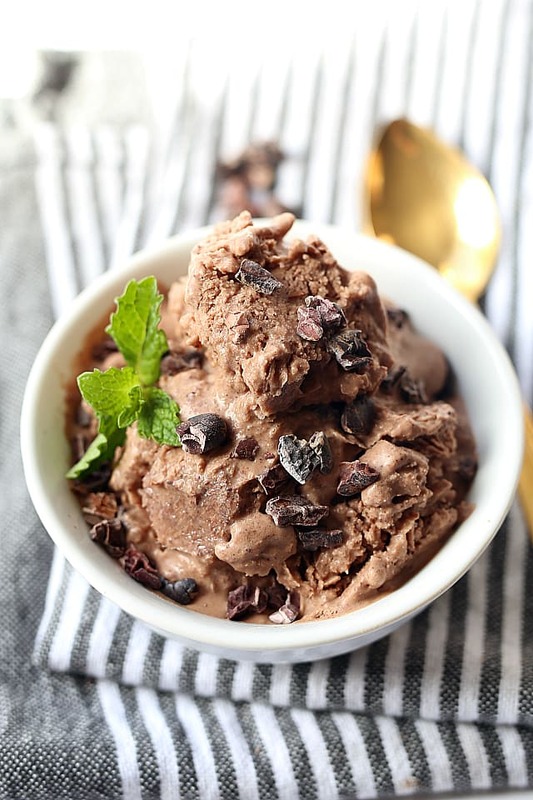 Sprinkle with raw cacao nibs as they will float and sink into the ice cream. 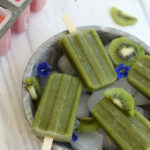 Freeze for 4-6 hours and mix with a spoon every 30 minutes for the first 2 hours to churn the ice cream or add to an ice cream maker and make according to manufacturers directions. Serve with warm brownies or your favorite ice cream toppings.